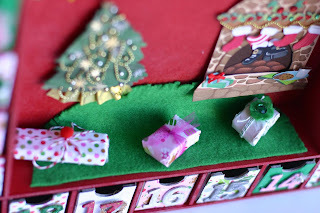 This is the advent calendar I started with. 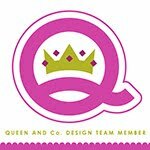 It is made by Kaisercraft. The outside is particle board and the drawers are plain chipboard. You have to assemble it, which wasn't my favorite part of the process. Not difficult, just not any fun. I spray painted the whole exterior and then covered the drawers with patterned paper and coated them with glossy mod podge. 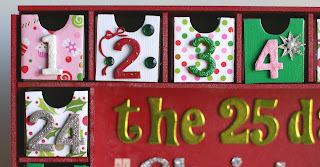 The chipboard numbers were also included and for those I inked, painted, glittered and again covered with Mod Podge. In the center I used some American Crafts Thickers and I was going to create my own paper mantle and hang stockings from it, but then I saw the cutest Jolee's mantle and Christmas tree and decided to take the quick and easy route. I laid down a felt "rug" placed the tree and mantle and strung the lights. The only items I hand made were the presents. I tried folding my own chipboard boxes and was unsuccessful so instead, I tore the handles off a brown paper shopping bag, rolled them into different sizes, taped them up and then wrapped and decorated them to look like mini presents. They are going to take turns opening a drawer each night. Sometimes there will be little treats and sometimes stickers or small toys or tickets for something special to do. I am not usually so on the ball with getting holiday stuff done in time, but I am so glad I got this project completed because it has really increased the already mounting excitement about Santa's visit. Now if I could only get everything else done!! Seriously, how CUTE is this? I love how you created the scene in the middle of the calendar. Great, great job! I LOVE THIS!!! Great job on this calendar, I think my favorite thing is those little presents. Your kids are going to love this for years to come! this is ADORABLE! I love it so much! OMGoodness this ROCKS!!! I love the design of it and those little presents are sooo cute!!! 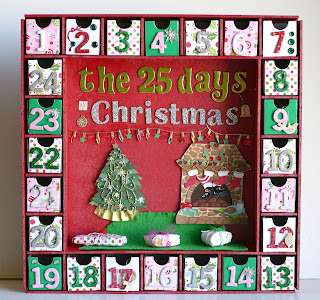 Everyone is making these cute advent calendars and I want to do one too! This looks so cute and I can just imagine that your kiddos adore this! I love it! I have wanted to do one of those, maybe next year.